If you haven’t already admired the master craftsmanship that goes into building the best furniture around, you owe it to yourself to take a look around the Amish Originals Furniture Company showroom. One stroll through the Westerville, Ohio showroom and you will be ready to buy Amish furniture for every room in your home. The best part is, you can! From single accent pieces to an entire household filled with Amish creations, you really can find it all. You can buy Amish Furniture for your dining room, living room and bedroom. Don’t overlook the stylish appeal and natural charm Amish furniture can add to your home office, home theater, kids’ room and even your outdoor seating and entertaining area. If it is an area that can be furnished, it can be furnished with Amish furniture. If you want the best in selection and quality service when it comes to meeting your home furnishing needs, you know Amish Originals Furniture Company is the trusted name for residents in and around the Northeast Ohio area. The best part is that you will know your quality Amish furnishings come from one of more than 70 local Amish families within the Northeast Ohio region. Show your support by shopping local and supporting a time honored tradition in quality furniture building. Because we have been in business since 1992, you can rest assured we have been working hard for almost two decades to serve the needs of our Ohio resident customers. By offering a wide variety of selection among the quality American hardwood built furniture we feel certain you will understand why we have established ourselves as one of the most trusted names when it comes to Amish furniture and home furnishings in general. The process used to create the Amish furniture you will want in your home is one of the cleanest building process still around to this day. You can take pride in knowing you are doing your part to be environmentally responsible when you buy Amish furniture. The finishing processes all meet the EPA requirements, and you will be glad to know the process also results in no waste. Also keep in mind that the scraps are utilized later for fuel and sawdust for livestock bedding. When we say no waste, we mean it. 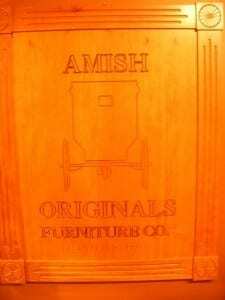 Amish Originals Furniture Company is proud to support green furniture production. We also take pride in supporting the local community through various channels such as the Westerville Area Resource Ministry (WARM) and the Uptown Westerville Farmers’ Market (UWFM). We do not just want to be a Northeast Ohio furniture store; we want to continue to be part of the local and statewide community. When you are ready to accent or completely furnish your home with the finest in Amish furnishings, we look forward to meeting your needs. We promise to make the process easy for you from the decision making to the delivery. Fill your home with furniture that is sure to become part of your own rich family history and buy Amish furniture from a local store.